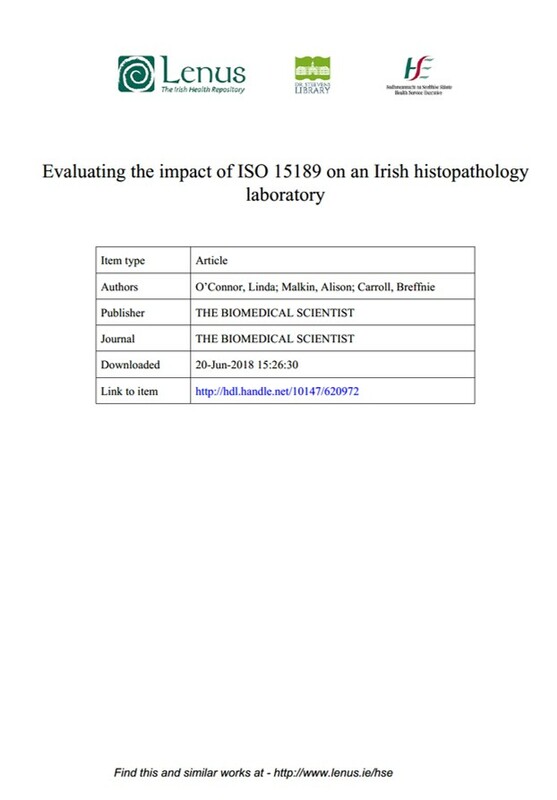 The aim of this study was to develop a method to evaluate the impact of the ISO 15189 standard on an Irish public hospital histopathology laboratory. Using a modification of the ISO Methodology method, a laboratory value chain was defined, a process flow was created and, from this, value drivers were determined. Based on the value drivers, a set of six performance indicators were selected. Using these performance indicators, various research methods could be employed to evaluate the impact of the implementation of the standards on any public hospital laboratory. The six performance indicators showed that ISO 15189 had, overall, a positive impact on the laboratory. Staff were impressed with the standardisation of methods, the traceability of work and the transparency of non-conformances. The most interesting observations from this project were that there were no improvements in EQA as a result of the implementation of ISO 15189. From the focus group review and the ethnographic analysis, the negative impacts were the paper trails and the inspections. These negatives should be used as constructive ways to move forward. Compliance with ISO 15189 is an ongoing necessary expense but should be regarded as a valuable asset that delivers real results. A copy of the summary is available here.